I don’t get that much Moustache wax to review and so when I saw the Beardpilot ‘LumberJack’ Moustache Wax, I was eager to test it. 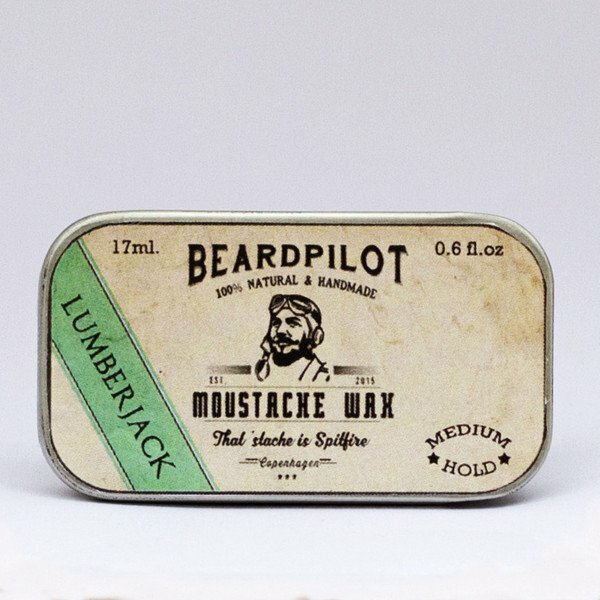 The Beard Oils and Balms have to join a queue but with Beardpilot: ‘LumberJack’ Moustache Wax I could test straight away. This was a very nice looking tin of ‘Lumberjack’ Moustache wax, its one of the slim tins with a sliding lid and that with the distinctive Beard Pilot branding makes this product really stand out. We buy based on description and reputation but we are also drawn by good branding and this is incredible branding! So once I had admired the tin, I scrapped out a small amount and worked it until soft, I then applied it to my moustache. It gave my Moustache a really nice hold, this is a medium hold wax and suits me perfectly. It has a nice subtle woodsy pine smell and contains Cedarwood, Spruce and Pine Oils to scent it and the oils have been blended well, I’m not a fan of Cedarwood but as the oils are balanced so well, it’s not a problem. Those oils are blended into a mix of Beeswax, Cocoa Butter, Lanolin, Coconut Oil and Sweet Almond Oil. ‘Lumberjack’ Moustache Wax comes in a 17ml tin and is available from the website for £16 GBP or KR 149 in Denmark and is also available in the following scents. I also really like that each Scent has its own different colour label, not only is this a very nice wax, the thought and time that has gone into their products and branding. Beardpilot is a top contender in the beard products market and the products are likely to draw in customers with its superb branding. I have a queue of oils and balms and I am really looking forward to getting to the Beardpilot Oils and Balms. How did it start? It all started with an out-of-control Moustache, a dried out beard, and a lack of products that could help with a desperate situation. In mid-2014, after having lived for some time in Cambridge, Salem (the founder and owner of Beardpilot) was looking for a beard product that could do more. Most existing brands had a very one dimensional approach to beards, and – even worse – most had unnatural and even potentially beard-destroying elements in them (we all know that alcohol and petroleum based products can dry out our skin and hair, so why the heck use it on our beards?). While no appropriate candidates were to be found in his native Copenhagen, Salem decided to make his own. After a great deal of trial and error, the first batch of Moustache Wax was ready for test run #001. It would take some more tweaking before the recipe was perfected (by now the rest of the beard had grown and was in need of some products… so back to the ‘lab’). By late December 2015, a full range of products was on the drawing board and, as ‘the needs of the many outweighed the needs of the one’, so Beardpilot was founded. The final round of testing, brand design, and production fine-tuning then began. Why Beardpilot? Well, it’s a name with a two meanings: firstly, it refers to the Moustache and beards of the Airmen of the First and Second World Wars – where having one’s beard in prime condition was part of the officers’ uniform. Secondly, it refers to the control element of using a good grooming product. While many beards go feral if left untamed, Beardpilot’s range of products lets one gain command and control over one’s facial hairs. What’s the Mission? This is where we see Beardpilot as a brand that is different from others adding a truly unique original take on beard-grooming. Beardpilot’s products are all 100% natural and Beardpilot prides itself in its products using no artificial components (no petroleum jelly here). Furthermore, Beardpilot is a brand that seeks to enhance different attributes in our products. We know that no two beards are the same, so the notion that one type of product fits all just seems misplaced and misguided. That is why our range of moustache waxes, beard balms, and beard oils all come in different variants, and not only in different fragrances. We want to offer you the best and most complete line of styling products that will fit both your beard and your mood. Who is the Beardo behind it all? Salem B.S. Dandan is the founder and owner of Beardpilot. Having worked for over 15 years in the retail trade, he then embarked on a career-change and started to study Political Science, eventually becoming a Ph.D candidate specialising in International Relations. While doing his studies in Denmark and the UK, and having been raised from a young age by entrepreneurs (also know as Mum & Dad), he saw the potential today for better beard and moustache products, and with tenacity launched Beardpilot. With a mix of Danish Viking ancestry, together with heralding from some inherited Mediterranean roots, he strives to bring out Modern Scandinavian aesthetics in his 100% natural and handmade products, looking also to the past to reassert that wholesome sense of quality over quantity. You can also follow Beardpilot on Instagram, Facebook and Twitter.